I’ve opined in the past that media coverage of agriculture in Minnesota and elsewhere tends to emphasize the bad times that farmers experience. It’s too soggy in the spring, it’s too dry in the summer, it’s a low-yield crop in the fall — those are the traditional laments that make the news on the rare occasions when the city slickers drop a few paragraphs on the lives of farmers. These days, even good times are tough times. 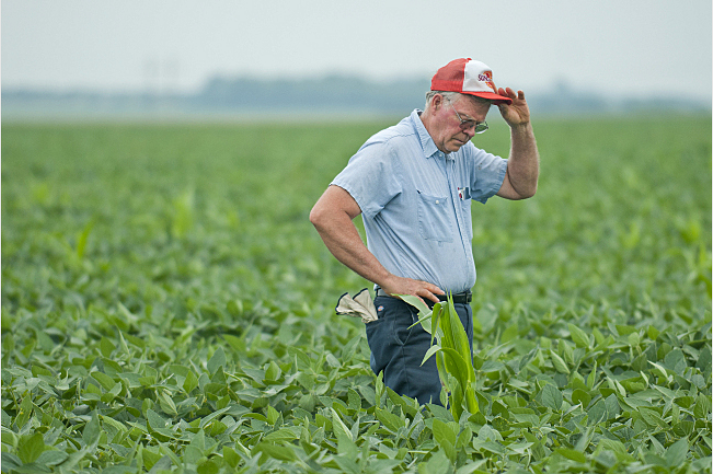 Farmers live in an economic structure that mere mortals can’t hope to comprehend. The problem this year? The harvest was too bountiful. And there it is: You hope your neighbor suffers one disaster after another so that you can live a better life. The bountiful harvest? It’s going to be bad news for everybody, our Nebraska farmer friend says. He’s not making it up. Good times can be bad times in the agriculture industry. But it presents a challenge in telling their story: What do you want the rest of us to do about it? How should we react? What should we hope for at the beginning of each season that doesn’t include hoping for the worst for your neighbors? To me, that’s always sort of been the irony in farming. If you have a good year, it’s likely everyone around you did too. High supply, which causes low prices. If you have a bad year, so does everyone else around you (usually), which leads to high prices, but it doesn’t matter – you’ve got nothing to sell. Granted, the demand side shifts too, but supply side economics seems, at least to me, to be a considerable influence in farming. I grew up in farm country, but I have zero sympathy for the ‘farmers’ this year, they are still making money. Complaining about their own self fulfilled prophecy coming true is just crazy to me. I remember stories and analysis going back at least 2-3 years talking about the coming bubble in the Ag market because farms overextended themselves by plowing marginal land and draining aquafirs to irrigate crops that shouldn’t grow where they are planting them. That coupled with buying or leasing lands at too high of costs to turn profits unless they got corn at continued record rates, and they have a perfect storm. You get that many people pumping that much production into the system and the bottom will fall out, it’s inevitable. They were lucky it took this long for the right weather circumstances to line up and cause a bumper harvest. They had a great run, this is just the inevitable correction. Hopefully they learn from this and diversify their plantings, stop pumping the earth dry to get corn to grow where it shouldn’t, and put marginal land back into CRP. The only people I feel sorry for this year are the small time production farmers, who don’t have the ability to hold out against large scale producers when the prices get low. Unfortunately we are going to lose some, but I sincerely hope not many. Couldn’t they just burn some of the corn the way oil companies in North Dakota burn off the natural gas they can’t sell? They would like to sell it, but it takes a lot of work and infrastructure to capture, clean, dry and transport Bakken natural gas, and they just haven’t kept pace with the new oil wells. It’s a potent greenhouse gas in its natural state (natural gas is mostly methane), so rather than vent it into the air, they burn (flare) it. Over the last two weeks, we criss-crossed the Northwest (ND, MT, ID, WA, WY and SD before returning back to Minnesota. Harvesting was in full swing and there was plenty of action at local elevators. While there were some trains with consists primarily made up of grain cars, oil trains dominated rail traffic. At more than one location, corn was literally sitting in huge piles alongside the elevator with tarps pieced together. Railroad cars were there, but no engines to pick up the grain. You can have a bumper crop, but if you can’t ship it (even at a lower market price) to a buyer, you’re left with bupkis. As an aside, we also saw a very short train heading westbound between Billings and Missoula carrying three Boeing 737 fuselages (presumably to Seattle or Everett). Also, too, do they need to grow corn / soy / oat? Are there no other crops they can grow in this area? I realize it isn’t California’s Central Valley, but c’mon. Until my generation, both sides of the family had direct ties to a family farm going back to the 1800s. It depends on what type of farming you do. Lower commodity prices may be bad for crop farmers but beneficial for dairy and livestock producers. which will encourage dairy and livestock overproduction. In other words, success invites imitation. Ag economics are a complete mess. Legislators encourage overproduction in an effort to keep raw materials for food cheap and plentiful. No president, senator or representative wants to explain high food prices or shortages; plus the big food manufacturers love low raw material prices. Farmers are pawns in this system, suffering through boom and bust after boom and bust …. In the meantime marginal land is wasted on excess production. We bemoan the loss of rain forest to agricultural interests on other continents, yet here in North America we have nearly eliminated the Great Plains ecosystem for our own agricultural needs, and we call it progress. There is also a sad lack of diversity in crops planted today. Gone are days of sunflowers, flax, etc. Also, simple crop rotation is a thing of the past. It’s nothing new apparently. My dad and his brother both decided to walk away from the family farm when they got out of the army after WWII for exactly this reason. Lots of work, usually too little money, and too little control over your fate. Kinda sad though to drive through the extended urbanside, which was once the countryside, and see housing developments, shopping centers and/or mysterious unmarked warehouses where fields of corn, flax, wheat or oats used to be. well the grain farmers get a few good years so now it is time for the dairy,chicken and beef farmers to get some relief with lower grain prices! No, I’d say the problem is that too many farmers made a bad bet in believing that the supply of corn would remain low for years and that the demand for corn would stay high for years, resulting in a high price for years. They forgot that the invisible hand of the market fixes imbalances like these. Had some very productive corn years in the mid 1950s when the price was $3 a bushel. That was considered great back then. Yikes! $4 a bushel now is way low. Starting to see similar stories about oil prices, how lower prices are a threat to producers and all the “downsides” of consumers paying less than $3 per gallon. Let’s say you work in an office for three years. You work hard all three years, doing pretty much the same amount of work. The first year you get an annual salary of $80,000. The next year it is $30,000. The third year it looks like $60,000, but drops to $50,000 at the last minute. How much will you make next year? Who knows? Sound like a good deal? That’s a bit how corn farming works. You still have to do the work every year (and pay the expenses), but you really never know how it will work out in the end. Some things — weather and corn prices — are just out of your control. You make the best decisions you can, based on your experience and resources. And that’s all good and accurate, but it doesn’t answer a single one of the questions I asked. 1) What do you want the rest of us to do about it? Nothing, directly, but it would be nice if people had some idea how farming works. Most of us city folk have no idea. I count myself among them who have only a vague idea. I don’t think many people understand how much the prices can vary harvest to harvest, and how little individual farmers, ranchers, etc. can do about it. 2) How should we react? What should we hope for at the beginning of each season that doesn’t include hoping for the worst for your neighbors? Every time someone gets a job, it means a number of other applicants missed out. Do we congratulate the person who landed the job, or feel bad for those who didn’t? It’s okay to do both, I guess. No one want to wish ill on others so our farmers will profit. The truth is, that’s just how it works. Bottom line is agriculture is still a very important part of Minnesota’s economy, especially in rural communities. A poor rural economy can have ripples that can be felt here in the cities, too. Likewise, when times are good, a few more boats get lifted. I would say a more apt job metaphor, considering the comments of our Nebraska farmer, is hoping someone who has a job gets hit and killed, so that a job opens up. Not exactly “salt of the earth” thinking. Thank God, I’m a country goy.